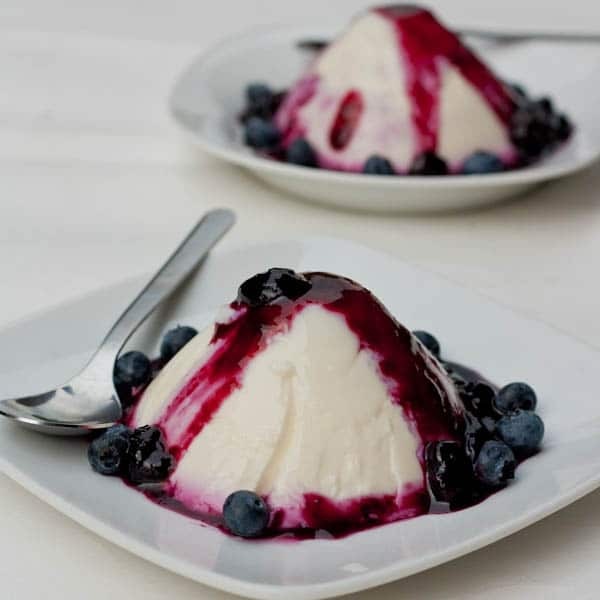 A simple yet sophisticated dessert to impress all your guests – this smooth and creamy Blueberry Panna Cotta Recipe is perfect. I can’t believe summer is ending and it’s already the last day in August. I guess the only consolation is that we get a full 3 day weekend to mourn the departure of frolicking by the pool and the gloomy arrival of fall then winter. I personally don’t think there are enough federal holidays but I’ll take as many as I can get and will happily spend this Monday out of the office. What are your Labor Day weekend plans? Any big ones? I’ve got quite a few. My best friend’s flying in, I’ve got a wedding to attend with D, a reunion with my college friends in NY, and on top of all that I’ve got to start packing up my entire apartment since I’m officially bidding farewell to DC a week from today. Oh and on top of all that I’m still trying to update this blog, and the travel blog as well as engage in social media. Do I have too much on my plate? You bet. I passed exhausted about two weeks ago. Let’s hope the adrenaline and excitement of my upcoming 2 year backpacking trip keeps me going for just a while longer. In the midst of all this I still have time to cook? You bet. Since I’m soon to be a wandering nomad without a stocked kitchen I’ve got to get all my cooking energy out now. So today I present to you one of my favorite desserts ever – blueberry panna cotta. 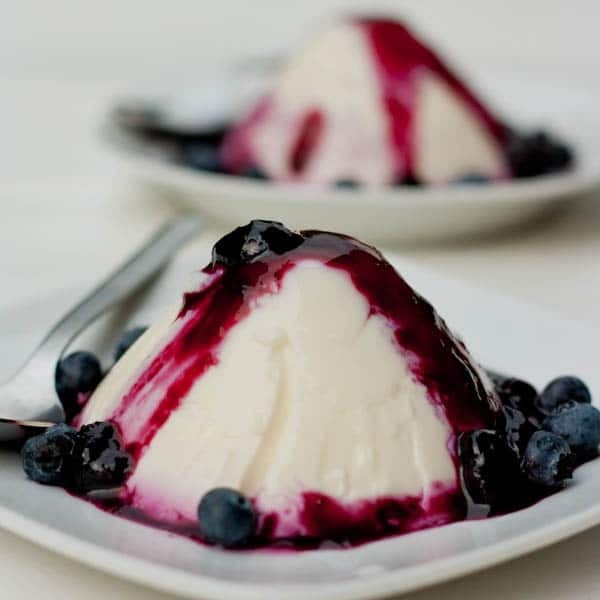 Silky, smoothy, creamy, delicate – blueberry panna cotta will have you oohing and aahing after the first bite. When topped with a lime infused blueberry sauce you won’t be able to resist. 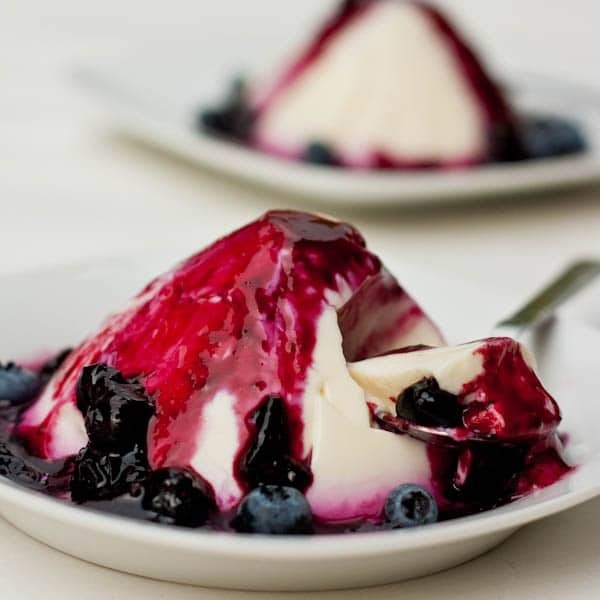 Best of all this impressive dessert is easy to make and can be made days ahead of time and with no baking required this panna cotta blueberry sauce dessert is the perfect dish to celebrate with this weekend. Add water to a small bowl and sprinkle gelatin evenly over the water. Let sit 5 minutes. In a pot combine heavy cream, milk and sugar. Heat over medium-high heat and remove from heat just before boiling. Once removed from heat add gelatin and vanilla extract and mix until smooth. Using a ladle pour panna cotta into cups, ramekins or glasses. In a small pan combine lime juice, zest, blueberries and sugar. Heat over medium low heat 5-10 minutes, stirring occasionally until thickened. Once panna cotta has solidified use a knife to run through the edges and flip the panna cotta over onto a plate. Top with blueberry sauce. LOVE panna cotta and had no idea it was so easy! Will definitely have to take a stab at it! Oh you’ve got to try making it yourself. SO easy and SO amazingly delicious! I don’t even like sweets and can never say no to panna cotta! Hi. I found this on Pinterest and it looks a amazing. You mentioned heavy cream in the instructions but not in the ingredient list. How much heavy cream is needed? Thanks! Apologies for not posting the heavy cream – not sure how that happened. I updated the recipe now but it requires 1.5 cups of heavy cream. Hope you enjoy the panna cotta! Hey, same here. Found this on Pinterest and I’d really like to make it, but how much cream do we use? The recipe required 1.5 cups heavy cream! Apologies for leaving it out! Hope you enjoy the panna cotta!